Scotch College won the sixth Head of the River race comfortably from Wesley on 23rd June. The race was again conducted on the Upper Yarra course rowing downstream from the Botanical Bridge. There was great controversy with Scotch College and Wesley objecting to race Melbourne Grammar claiming that J.G. Burton, their three man was not a bona fide pupil. In those days, there were practically no rules had been laid down as to what constituted a bona fide pupil, each school interpreting the term as suited itself. Melbourne Grammar insisted that Burton was a bona fide student and they stuck to their guns, eventually withdrawing from the race. Wesley were the favourites showing good form in training but deteriorated in the race. Their steering also left a lot to be desired and contributed to their loss. 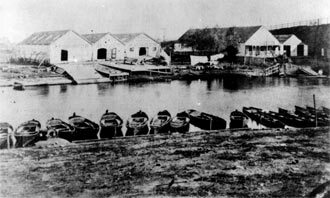 Edwards boatshed circa 1860 on south bank of Yarra River. The Old Prince's Bridge is to the right. The Age reported on the final. The Wesley College, having won the toss elected to take the north side. A very fair start was effected shortly before five o’clock, but the crews had not gone many strokes when the Wesley coxswain pulled his left hand line, and had it not been for the good steering of Edwards would have fouled the Scotch College. Both boats were soon righted, keeping well together down the first stretch. On coming round the baths corner the Scotch College were leading, which they increased from a length at Brander’s to three lengths by the time they passed the judge.